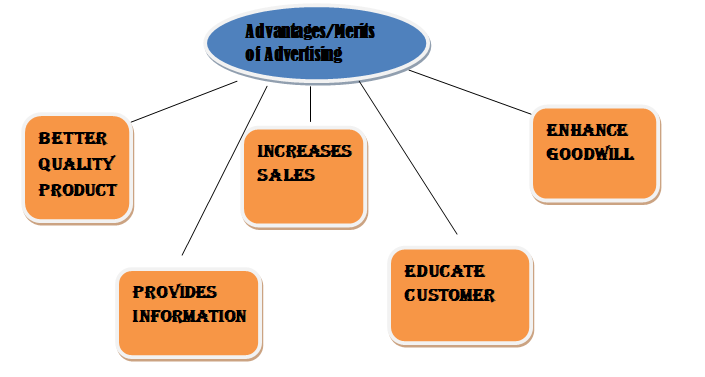 Concept of Advertising: Meaning, Features, Importance,Advantages/Merits or Disadvantages/Demerits. In this article we will discuss about Concept of Advertising: Meaning, Features, Importance, Advantages/Merits or Disadvantages/Demerits. Advertising is a small part of marketing in which the product is promoted or sells by audio or visual form of marketing communication. It can be defined as the “Non-personal presentation and promotion of goods, services and ideas by a specified sponsor in paid form”. It may be on paper, TV or online. Paid form: The specified sponsor has to pay for advertisement of goods, services and ideas. Impersonal: Advertising provides direct line of communication but there is no face to face communication between customers and advertise. Specified sponsor: Different advertiser is identified for different company or firm. Better quality product: Advertising helps company or firm to advertise their product to its customer with its better quality. Provides information: Advertisement helps company to provide product information to its customer. Increases sales: Advertising increases the sales of the product which helps company to increases its sales and achievement of company goal. Enhance goodwill: Advertising also increase the goodwill of the product as well as company which manufacturing the product. Educate customer: Advertising is educational and dynamic in nature. It familiarizes the customers with the new products and their diverse uses and also educates them about the new uses of existing products. Impersonal communication: Advertising is a source of communication in which there is no direct communication between customer and adviser. So it provides lack of face to face communication. Difficult in media choice: In advertising there is a wider range of product available but it is difficult for customer to choice whether which product is good or not. Inflexible: Advertising is inflexible in nature because it can’t be change according to the need of the customer. Lack of feedback: There is lack of feedback on advertising because now days it is common so customer couldn’t pay interest. We have studied Concept of Advertising: Meaning, Features, Importance,Advantages/Merits or Disadvantages/Demerits.if you have any query please comment.